The resident pride of six lions were seen trying their luck on wildebeest at the Wildlife waterhole. Unfortunately for them the lack of cover made it hard for them to launch a successful ambush. Black-backed jackal were skirting around the periphery of the action hoping to have the chance to scavenge. Two lionesses were also seen hunting springbok in front of the camp, but once again they did not manage. We saw them with three cubs looking very hungry. Later in the month their luck turned and we saw the same lionesses with their young feasting for two days on the carcass of an elephant calf which had died from natural causes. One morning we saw them trying to stalk springbok which were congregated in the vicinity of the waterhole, but failed because the area was too open. We saw the lionesses and cubs in camp one morning, they were calling and trying to locate the rest of the pride. Three cheetah were seen together on the open plains, a male was feeding on a springbok and being watched by two females. The females tried to approach but the male made it very clear that he wanted the meal for himself. Later in the month we had a spectacular sighting of the two females taking down and killing a springbok. A few metres from camp we spotted a male cheetah hunting springbok. It was not successful and the cat lay panting in the shade of an umbrella-thorn tree after the chase. A few days later it seemed that he had had enough of trying to hunt solo and we saw him as he was calling his coalition partner; next time we came across him the two males were back teamed up again. There were still plenty of elephants in the area, congregating at the camp waterhole during the days making for interesting viewing from the main area and the guest rooms. The numbers of antelope increased during the month as they herded towards Nxai Pan to take advantage of the nutritious pan grasses which are so important to support lactation during their breeding season. At the camp waterhole we saw large herds of springbok with lambs. On the way to Baines Baobabs we encountered oryx, steenbok and springbok. Towards the end of the month the annual migration of zebras started to arrive at Nxai Pan. 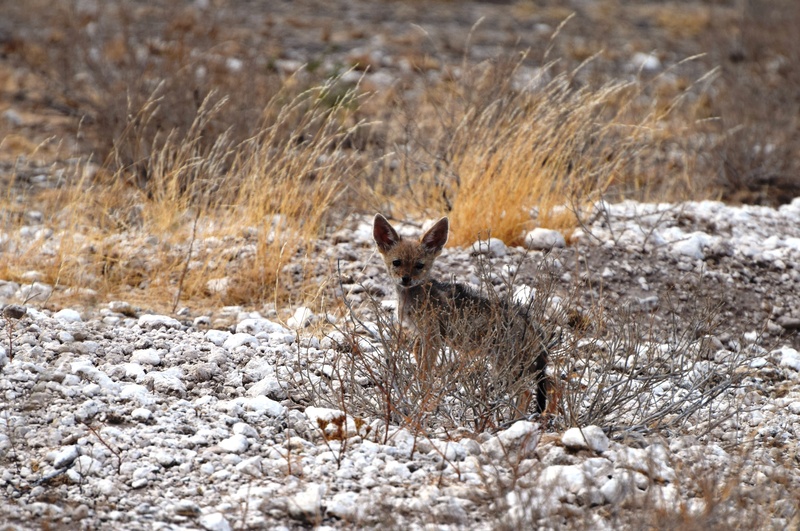 A wonderful family of two adult black-backed jackals with six puppies were found on West Road and a female bat-eared fox with a single puppy was denning on Middle Road. We watched as lots of jackals worked the area around the waterhole, spreading out the elephant dung in search of dung beetles to eat. We were lucky enough to spot a brown hyena although as we were looking at it a black-backed jackal came rushing in from nowhere to chase the bigger predator away. A rock monitor lizard was found foraging on millipedes and grasshoppers. Lots of summer migrants were in the area including steppe buzzards, European bee-eaters, lesser grey shrikes and red-backed shrikes. A pride of ostrich was seen near the waterhole grazing. Lanner falcons were seen close to a termite mound feeding on the winged alates coming out to fly. We also saw many goshawks and kestrels.